Winter is wonderful with all the earthy vegetables. 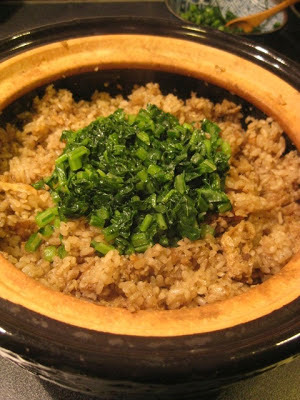 One of my favorite earthy dishes is burdock root ("gobo") rice in double-lid donabe rice cooker, "Kamado-san". I call it "dirty" rice, because this aromatic root vegetable makes the rice so earthy both in flavor and color. To make this dish, you first pulse the burdock root in food processor until it's coarsely minced into just about the same size as the rice grain. Then, simply spread over the rice and cook in liquid of dashi stock and seasonings. 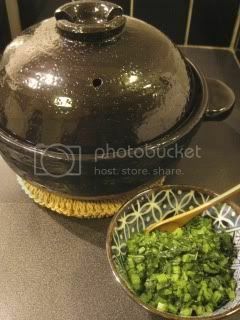 To serve the rice, I like to accompany some sautéed Japanese turnip ("kabu") leaves. You can top the rice with the leaves or mix them together. If you can't find kabu leaves, other leafy green such as dandelion or kale would work, too. Here's the recipe. Rinse the rice and drain. Set aside. Cut the burdock root into 1" (2.5 cm) long pieces. 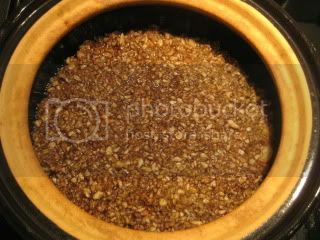 Put the burdock root and 3-4 tablespoons of dashi stock in food processor. Pulse until burdock root is coarsely minced into rice grain size. Set “Kamado-san” over medium-higih heat and cook for 12-15 minutes, or until 2 minutes after the steam starts puffing. Meanwhile, heat the sesame oil in a sauté pan over medium-high heat. Sauté the Japanese turnip leaves until they are wilted (about 1-2 minutes). Toss with the salt and sesame seeds. Set aside.